Sometimes, simpler is better. Keeping the functionality limited so that you can concentrate on what works. There will always be a market for mid-range and budget peripherals, simply because they work and are inexpensive. So what if you want to keep things simple, but a little special, too? COUGAR’s mid-range 600 series might have the answer. With COUGAR releasing a full set of peripherals the last few months, we are going to take a look at its mid-range offerings, starting with the 600M gaming mouse. Keeping many of the internals from its high-end 700 series, COUGAR tweaked its designs, dropped the budget, and introduced a whole lot of orange. 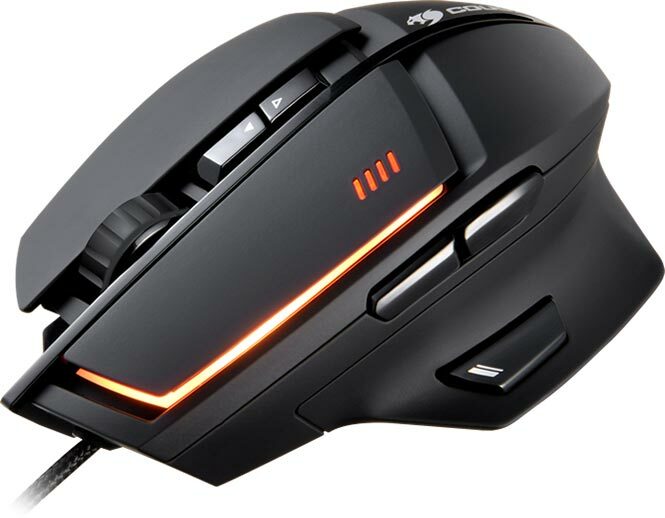 The 600M is a very standard gaming mouse, with only a few extras unlike the 700M. It still packs the 8200 DPI sensor of its bigger brother, but only 8 buttons, including the favorite that is the sniper button. There is some adjustable lighting, plenty of tweaks, and a unified software stack. It’s not exciting, but it all works, and that’s what’s important. If that doesn’t catch your eye, I don’t know what will. The 600M is definitely a gaming mouse with a mix of hard edges, smooth sides, aggressively angular, but only available as a right-handed model. It’s not going to be for everyone aesthetically, but it’s very comfortable and most of all, functional… and oh so very orange. In terms of button layout, the 600M is fairly standard. Two large buttons, scroll wheel, and DPI selectors on top, forward and back buttons on the side, and the ‘sniper’ button under the thumb. The cable is the usual nylon braided, but with an offset position from the center from the body. When the thumb rest is taken into account, it’s centered. My only complaint is that the snipe button is not ergonomically placed, as it requires a downward force from the thumb, rather than an inward push, so it can be awkward to use. Still, the snipe button remains reasonably lightweight, with just enough give to prevent accidental pushing. All of the buttons are quite light to the touch – a personal preference of mine. They are easily pressed, thus reducing fatigue in long sessions. Of particular note is the scroll button, as this is one of the easiest and lightest I’ve used in some time. The scroll is firm enough to prevent undesirable weapon swaps, but the button is light enough for use as a push-to-talk. Unfortunately, the rubber does not provide quite enough traction when hands get slippery from sweat, so it will need frequent cleaning. The underside is very basic, providing a number of very thin PTFE surfaces around the edge, though thankfully nothing directly under the sensor to accumulate dust. There is also a back-light under the left mouse button which has a full color range available, configurable via the software. As is always the case with peripherals, it doesn’t matter how good the hardware is, it’s the software that makes or breaks (sometimes literally) the deal. There have been far too many mistakes we’ve seen, and it’s always the dread point in a lot of our reviews. If you have read any of our other COUGAR reviews (700K and 700M), then the software will look familiar, and at this point we should be thankful. COUGAR has done a most impressive job and it certainly sets a high standard of comparison. It’s by no means perfect, but out of the dozens of suites we’ve used, it’s one of the best. Logitech still sets the gold standard, but COUGAR deserves some recognition for its efforts. First and foremost, everything is accessible, easy to click and easy to find specific functions. All of the important stuff relating to this mouse is available right on the first tab. DPI control with optional independent axis adjustment, poll rate, angle snapping, Windows mouse speed and acceleration, and finally, lift height. Simple layout and easy to read. Different profiles can be set and loaded, however, its game management is a little finicky. First you need to create a new profile and name it, then set the executables with which it’s tied to, and then you can set it to a specific mouse profile. Additionally, macro management and button assignment require the drag and drop of icons from the right-side panel. Also, by default, the sniper button is unassigned, meaning that the mouse doesn’t make use of internal memory. Lighting for the 600M is limited compared to some other peripherals from COUGAR, but the option is there and it’s pretty accurate, too. The lights denoting the DPI level can not be changed, but the left button strip can. Should you have other peripherals by COUGAR, these can all be adjusted within the same manager, as you can cycle through each of them in the bottom-left corner. This also allows you to use some of the more advanced features that let you synchronize profiles or take advantage of modifier keys on a different peripheral. It’s not perfect, but it works, and that’s what’s important. The COUGAR 600M has been in my grubby hands for a while, and tested within a multitude of games and applications. It never skipped a beat, it never went flying off at random times, and I didn’t notice any peculiarities with negative acceleration. My desk is prone to vibrations, be it from fans, the PC or the occasional rumble from traffic, and as such, very sensitive mice are prone to waking my system’s monitor up from sleep. Despite the 8200 DPI, this was not a major issue. Other mice with the same DPI and system settings have woken the system up frequently, but this COUGAR 600M would very rarely wake the system up. It still happens on occasion, but not as frequently as some of the other mice I have used. When setting the lift height, it’s worth noting that when set too low, the mouse is likely to track positively on the Y-axis, meaning it will drift up with frequent lifting and dropping of the mouse. Keeping the mouse at the mid lift height prevents this and appears to be the more optimum position. If you are a low DPI user who frequently lifts their mice, use the mid lift height to prevent poor tracking. The placement of the snipe button is not ergonomic for me, and its use disrupted my ability to accurately left-click. As such, I couldn’t really use it as a DPI reduction. Using it as another macro key is fine though, for example, as melee or grenade attacks in FPSes, or as an ability trigger in an MMO. As mentioned previously, the scroll wheel does become slightly slippery for me, even shortly after being cleaned. So if you suffer from the joys of sweaty hands, you may find after long gaming sessions that the scroll wheel requires more effort to use, especially if you have a light touch. The software behaved itself, switching profiles without issue. Macros triggered and performed as expected. Again, not exciting, but it works, which is the very least I expect from peripherals. If orange is not your thing, the 600M comes in a more generic black, but where’s the fun in that? Bring some color to your desk and stick with the orange – at the very least, it’ll be a good conversation starter. COUGAR is doing well with its peripherals. Responsive buttons (including a light scroll button). Thumb button not in an ideal position. Software could still do with some polish. Jamie has been abusing computers since he was a little lad. What began as a curiosity quickly turned into an obsession. 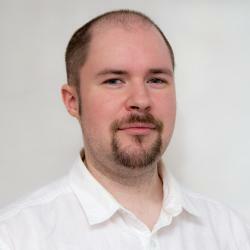 As senior editor for Techgage, Jamie handles content publishing, web development, news and product reviews, with a focus on peripherals, audio, networking, and full systems.